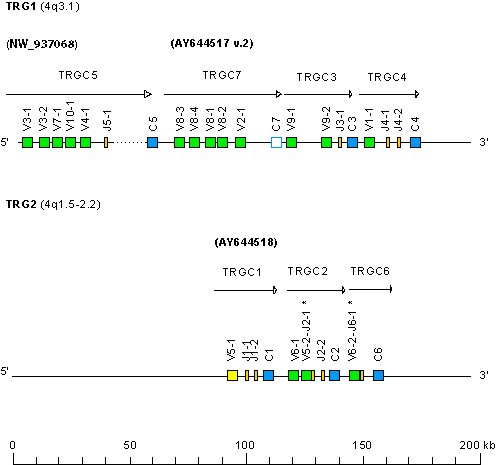 The TRG1 locus at position 4q3.1 spans about 250 kb and comprises four TRGC genes (TRGC3, TRGC4, TRGC5 and TRGC7). The TRG2 locus at 4q1.5-2-2 spans about 190 kb and comprises three TRGC (TRGC1, TRGC2 and TRGC6). * In AY644518 TRGV5-2 is rearranged with TRGJ2-1 and TRGV6-2 is rearranged with TRGJ6-1.